It’s the holiday season, and for many people, that means spending a lot of quality time with relatives. For some of us, it may also mean getting a few probing (but well-meaning) questions! If you’ve recently gotten a product in the Helix Store, those questions might be about your results. 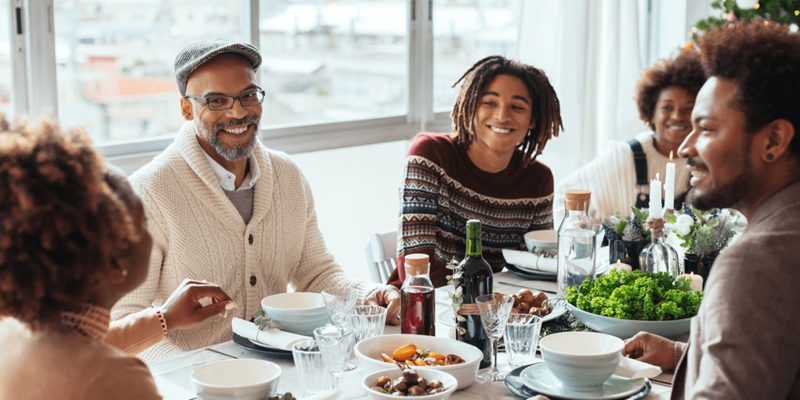 Not to worry: to help make your holiday family time a bit easier, I’ve listed 12 of these kinds of questions below, and how you can answer them. Because of how genetic ancestry testing works, the answer to this one will often be “No.” Looking at your genetic ancestry tends to reveal the regions and continents that your ancestors came from—but not necessarily the modern-day countries or cultures. So rather than saying you’re Scottish, Japanese, or Nigerian, your results would likely say that your recent ancestors came from Northwest Europe, East Asia, or West Africa. This distinction is important because a person’s cultural identity is complex, and cannot be explained by DNA alone. For example, DNA cannot tell you whether you’re Native American—only the tribes themselves can determine whether someone is a member. No Native American tribes are currently using commercial genetic ancestry testing as a primary determining factor of tribal membership. Products that look at deep ancestral lineages talk about a key fact of population genetics: The human species got its start in Africa. While humans have spread across the other continents over the last 100,000 years or so, the DNA in our mitochondria (and, for males, Y chromosomes) can often be traced all the way back to our African ancestors. Those two kinds of DNA don’t recombine like autosomal DNA, so they’re easier to trace back to Africa. They can also highlight some of the stops your ancestors made as they left Africa. Only people with more recent African ancestry (like many African Americans) will see African ancestry in their autosomal DNA. For anyone with some recent non-African ancestry, the answer is typically “Yes, a little!” But when your results include a percentage of archaic, seemingly non-human ancestry, it doesn’t mean that you have some great-grandparent who was a Neanderthal or Denisovan (or that you’re a hybrid human). Instead, that small percentage of non-human DNA reflects a more ancient history of Homo sapiens (modern humans) interbreeding with other hominids after they spread outside of Africa. Many people in modern times have inherited some Neanderthal DNA, and research into these ancient humans has revealed that they may not have been the brutish cavemen we once thought they were! You could be, but that’s not what you’ll tend to learn from products that compare your genetics with famous people. Instead of direct descendance, your results are likely more about a shared ancestry that goes back thousands of years. So you and Genghis Khan are descended from the same person (which is still cool). No, for a variety of reasons—with the most crucial being that products that create a pattern from your DNA don’t use your full genome. After all, it’s likely impossible to actually make a product that displays your whole genome in a size that would work for clothing. Instead, they use a small portion of your DNA to make a cool pattern and give you some details about your traits. And while bioethicists and policy makers can debate about a lot with cloning, no one can argue that someone with the exact same pattern as you is your clone. Even if your honest answer is “No, I won’t like it,” that dislike doesn’t entirely depend on your genetics—but that’s part of what makes taste genetics interesting. Your results from a product that looks at your taste preferences will only explain some of the factors behind them. Your diet, environment, or even culture can have affect your taste preferences as well. So even if you’re more likely to prefer white wine to red, and sweet snacks to salty, it doesn’t mean that there won’t be red wines and salty snacks that you enjoy. Dietary restrictions (like food sensitivities and intolerances) are a whole different story, set apart from taste preferences. If your results tell you that you have a higher chance of being lactose or gluten intolerant, you have a higher chance of responding “can’t” to that relative offering you foods with dairy or gluten. Of course, because your genetics aren’t your destiny, you’ll have to listen to your body and check with your doctor before you know for sure. Not necessarily! There’s a spectrum of responses to most food sensitivities, both in terms of what foods cause reactions and how people experience their reactions. Someone with a milder sensitivity or intolerance may not have connected their symptoms to food. There may also be foods that you’re sensitive to that you haven’t yet tried (and can now know to avoid). Hitting the gym can be an important part of maintaining a healthy weight (or getting back to one as part of your New Year’s resolutions), and generally speaking, most people can benefit from going to the gym. But the same exercise regimen may lead to different results for different people, and a small part of that difference can be genetic. If you learn what exercises might be better for you, you may see better results from your workouts—and be more motivated to do them consistently. Most fad dieting is one-size-fits-all and prescribes blanket bans on certain foods or nutrients (like carbohydrates or gluten). Instead, nutrition suggestions based on DNA testing are all about giving you nuanced, personalized recommendations. There are many factors that affect how your body processes food and responds to exercise—one of which is genetics. Knowing how your genetics contributes to your wellness may help you make small, meaningful changes to your lifestyle. Depending on the disease, your results may help you understand more about why it runs in your family. If a disease is passed on in a recessive pattern, or if it is highly penetrant, your results could help you learn why multiple family members have been affected by it and how likely it is that others will be too. But, the genetics of health are often complicated, and many diseases are the result of multiple genetic and non-genetic factors. We’re also not sure about the genetic bases of some common conditions. Your results may not be able to help you understand why these diseases run in your family, but they’re a good place to start. Depending on the disease, your results may help you understand more about why it runs in your family. We can’t really help you with this one. But sharing what your results say about your potential children and what they could inherit might help you dodge the question until the next holiday! From all of us at Helix, happy holidays!